Mixing lampwork glass beads with seed beads results in a piece with a lot of great texture and variation. I started by making some matched pairs of beads in shades of blue, mostly cobalt, which featured dichroic glass, enamels, and foil. I also made one larger tabular piece to use as a focal bead. My final choice for this necklace included the focal bead, 5 matched pairs to surround it, and 1 extra bead for the end of the chain. When choosing the beads you wish to use, whether you make your own beads or buy them, pick enough to equal about 5 to 6 inches when strung on wire. 1. Lay out your lampwork beads in the order you desire. Measure the length of the beads in total. 2. 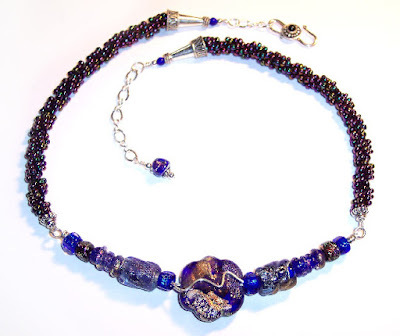 Cut one piece of 18 gauge wire ½ inch longer than the length of the beads. Cut a second piece 3 inches longer than the length of the beads. Slide all of the beads onto the shorter length and center them. 3. Slide the second piece of wire through, but bring the wire to the front of your central focal bead instead of through its hole. Center the beads on this wire as well. 4. Use your round nose pliers to create a couple of graceful curves in the exposed wire in the center. 5. Create wrapped loops on each end. Clip off the shorter wires even with the first bend you make with the longer wire to create the wrapped loop (shown below). File it smooth before wrapping the longer wire around both wires. Bend the whole piece into a gentle curve. There is a tutorial for making a wrapped loop at the link. 6. Create two lengths of spiral stitch using size 8/0 seed beads. I made each of mine a little over 5 inches long. There is a tutorial for doing a simple spiral stitch at the link. 7. When your spiral strands are the length you desire, stitch the thread back down and up a few of the beads to anchor it on each end. 8. To attach the spiral strands to the wired lampwork, use one tail on each strand to stitch through a bead cap and through a ½ inch piece of french wire. Take the wire-covered thread through the wrapped loop of the lampwork piece and stitch back up through the bead cap. Anchor the thread through some of the beads and repeat, carefully stitching back through the french wire a second time. It will stretch to accommodate a second pass, and if you are careful, you will not distort the spring-like structure. Anchor the thread well in the spiral beads, and repeat on the other side. 9. Using a piece of 20 gauge wire, make a small loop on one end. Attach the free end of one spiral strand to this loop, stitching through it and weaving through the top beads several times to anchor it well. Repeat with the other strand. 10. Thread a cone, a 4mm cobalt glass round, and a 3mm sterling silver round on each wire. Create a wrapped loop around the sterling silver chain, 2 inches on one side and ½ inch on the other. Attach the hook to the shorter piece of chain. 11. Slide your extra lampwork bead onto a headpin, surrounded by 2 daisy spacers and 2 sterling silver rounds. Create a wrapped loop around the end of the longer piece of chain.